The Precious Garland of Advice for the King (Sanskrit: Rajaparikatha-ratnamala) was written by Nagarjuna and belongs in his collection of advice texts. 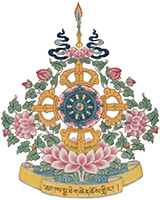 In his Precious Garland, he clarifies the Buddha’s wisdom of emptiness teaching based on the Perfection of Wisdom Sutras as well as extensively describing the Bodhisattva’s deeds of compassion and skillful methods. It also includes an explanation of the Bodhisattva’s stages of the paths for higher rebirth and complete enlightenment.